Summers and Mangoes are meant for each other! Whole year we are just waiting for Mangoes and finally Mango season arrives with Summer. I am all set to make bunch of Mangoes dishes. 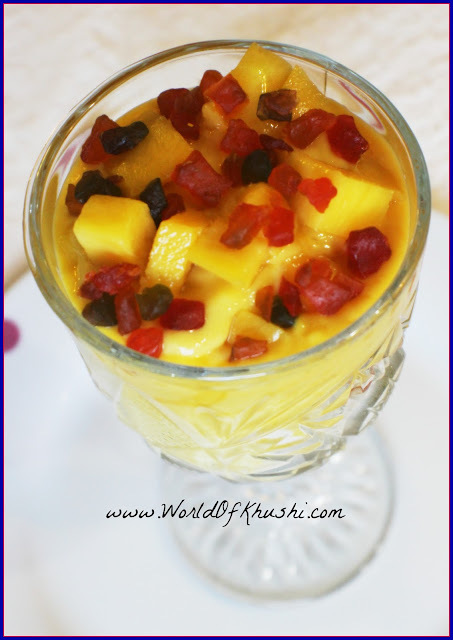 In today's post I am preparing Mango Mastani which has richness of Mango with a blend of some Ice-cream flavor. It's very filling recipe which can serve as both a Beverage or a Dessert. Lets get started on the recipe. Step 1. In a Blender, add Milk, Condensed Milk, Dry-fruits, Cardamom Powder, Saffron and 1 chopped Mango. Step 2. Make it a thick shake consistency. Step 3. In a big glass, add Vanilla Ice-Cream then add little Mango Shake. Step 4. Now add chopped Mangoes and dry-fruits as a next layer. Step 5. Again add Mango shake then add chopped Mangoes and Tutti-Frutti . Step 6. 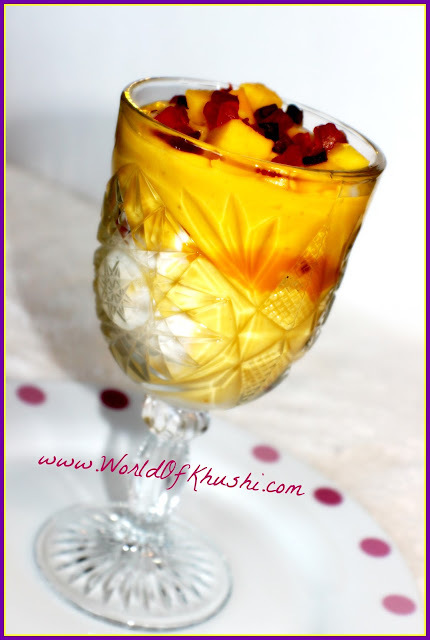 Continue the same process (making layers of shake, dry-fruits and chopped Mangoes) until the glass is completely filled. Garnish it with chopped Mangoes and with some Trutti-Frutti. Your delicious Mango Mastani is ready. Serve chilled!! I hope you people love this recipe, do try and let me know your feedback. Also share your pictures with me, would love to see them!! Guys do like the post & share it with everyone you know. Join me on Khushi's World Facebook Page, Google+ , Instagram and Pinterest for more Posts. I will see you in next post till then take care.